I am a news producer. When covering the news, I strive to remain neutral and unbiased. I identify the facts, double check the facts and deliver the facts. That is how I’ve been trained. That is how a good journalist tells a story. But as images from flood-ravaged Louisiana flood our screens this week, I cannot keep my emotional distance. I grew up in Baton Rouge. I am now a part of the story. On Saturday night, my parents went to sleep confident that the rain falling on the state was just another big rainstorm. It wasn’t. On Sunday morning, I received a text from them saying flood waters were at their doorstep. Never before, in the more than 25 years that my family has lived in our one-story home, had water risen past our sidewalks. Not during Hurricane Andrew. Not during Hurricane Gustav. Over the course of the next six hours, I received photo after photo of rising water entering our house. The cream-colored carpet covering most of our floors became a muddy-brown lake. Two Ethan Allen sofas — the first items my parents had splurged on after putting my brother and me through college — sat helplessly, taking on water. The canopy bed I’d slept on for 16 years became an island in the muck piled high with drawers of clothes and other belongings. Facebook messages from friends let me know the National Guard was in the neighborhood getting people out. But with an entire neighborhood now flooded — and what would eventually become 20 parishes impacted — resources were stretched thin. In the end, the people who evacuated my parents were friends of a friend. Regular people who had a boat and wanted to help. 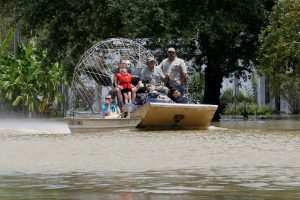 It turns out, they were also one of hundreds of Louisiana citizens who volunteered their time and their boats to rescue those stranded by the rising waters. 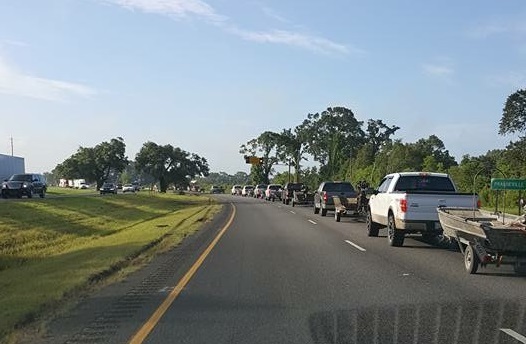 In the Sportsman’s Paradise, there is no shortage of fisherman and hunters and no shortage of boats, and the so-called “Cajun Navy” had taken to the roads and waterways to ferry their fellow Louisianans to safety. Some of the volunteer armada operated on their own. Others coordinated their efforts through social media. Together, they supplemented the efforts of the many National Guardsmen, state officials and Coast Guardsmen operating in the flood zone. Retired United States Coast Guard Commander Jimmy Duckworth got the call Saturday afternoon that boats and men were needed in Denham Springs, where 90 percent of homes eventually flooded. He believes their team ultimately rescued as many as 600 people. “We had a dozen boats and 20 guys operating most of the time,” he said. Lauren Campbell and her boyfriend Heath Clouatre rode aboard friends’ boats for two days as they rescued people from the high water in Baton Rouge. With AT&T cell phone service down, they got updates from the Cajun Navy on where to head next by using free Wi-Fi from a flooded McDonald’s. 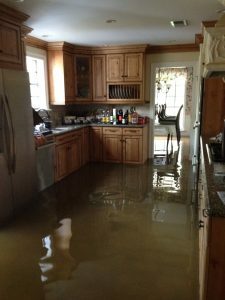 Among those rescued by Campbell and her friends over the course of two days: a paralyzed woman with multiple sclerosis trapped in a house filled with 18 inches of water, and a family of five who had been inside their flooded home for two days. But she worried about those who may not have gotten out in time. 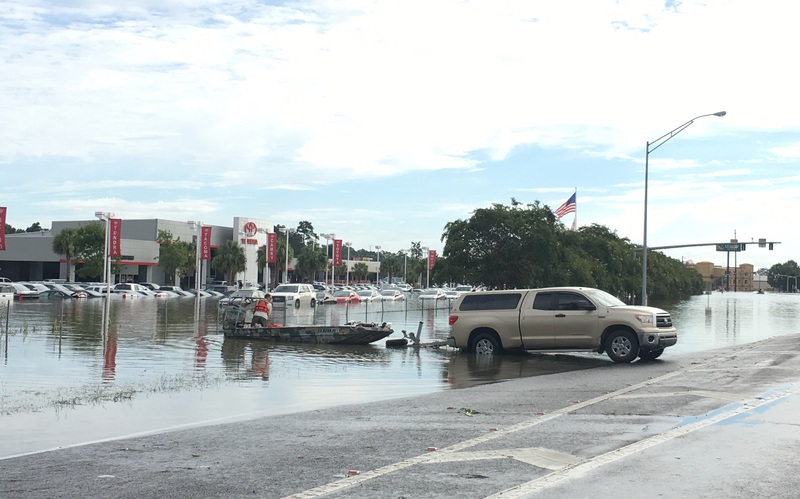 Ashley Ferguson, a fish biologist, and her husband, a physician’s assistant, launched their boat from a Baton Rouge car dealership parking lot filled with submerged vehicles. Coordinating with other boaters, they motored house by house peering in windows. One elderly man waved them down from a distance. He and his disabled wife had watched helplessly as waters filled their home overnight. Duckworth also worked the Hurricane Katrina response with the Coast Guard. He credits the National Guard and the Coast Guard for stepping up during the latest floods, but remains frustrated with the overall response. “[If] I’m seeing elderly people in a Wal-Mart parking lot for hours on end with no help in sight, then I’m mad about that, and I think all my fellow citizens, no matter what state you’re from should be mad about that,” he said. For Ferguson, the scenes are all too familiar. She talked her way through police checkpoints to get to her grandmother’s flood-filled home after Katrina. She saw boats on the ground that had been tied halfway up trees, drained cars with foggy windows and visible floodlines and vehicles with windshields shattered by boat propellers. 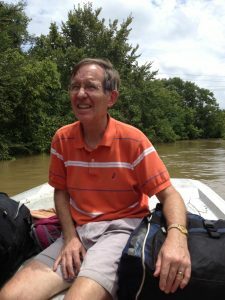 Campbell added that while the flood and extent of the rescue effort took everyone by surprise, those struck by tragedy have been remarkably resilient. As my parents returned to their home Tuesday, they too were grateful. Grateful for the outpouring of support from friends and acquaintances. Grateful to so many people willing to house them, provide a meal, pull out carpet, take out drywall or move furniture. Grateful simply for warm and familiar smiles. In the end, 1.5 feet of water filled our home. My parents lost furniture, appliances, home movies, perhaps even the sense that they are immune to nature’s ravages. But there are those who are worse off. Those who lost everything. And yet, what a supportive community they still have.